As I am sure you are now aware, our statewide agreement with the governor's office and the State College/University presidents expired on June 30th. We requested dates to negotiate a successor agreement, but Office of Employee Relations (OER) agreed to meet with our negotiating committee only once, July 17, with no further dates planned at this point. 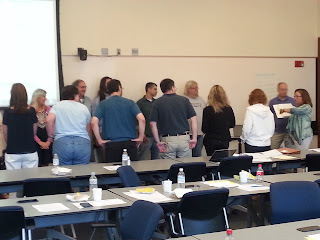 The OER recently sent a letter to our statewide Council President Tim Haresign stating that the State Colleges/Universities will not continue to pay normal increments (Steps) to our unit members and that the future of the increments is dependent upon mutual agreement during contract negotiations. You can see that entire letter here. 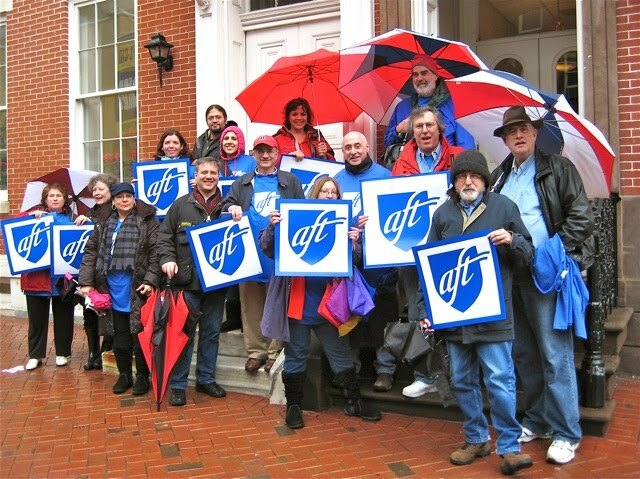 contact us at Union@aftlocal1904.org and we'll get back to you with answers. We'll also update the FAQ, which will be posted to our website, as necessary. Out of the following 38 countries, where you think the US ranks in terms of providing paid or protected leave to new parents? Australia, Austria, Belgium, Britain, Bulgaria, Canada, Czeck Republic, Denmark, Estonia, Finland, France, Germany, Greece, Hungary, Iceland, Ireland, Israel, Italy, Japan, Latvia, Lithuania, Luxembourg, Malta, Mexico, Netherlands, New Zealand, Norway, Poland, Portugal, Romania, Slovakia, Slovania, South Korea, Spain, Sweden, Switzerland, Turkey, United States. Protected leave only means that you can’t lose your job for taking time off to care for a new child, and workers in the US have only been guaranteed 12 weeks of protected leave since 1993 when the Family and Medical Leave Act (FMLA) was enacted. Plus, in order to qualify, you have to have been employed for at least a year, by an organization with 50 or more employees. 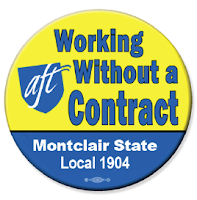 That covers most employees of Montclair State University, and the good news is that both parents may take the 12 weeks of leave. The bad news is: in most cases those are weeks without pay. In the first place, FMLA only provides job protection, not payment, while you are on parental leave. In the second place, even if you have accumulated plenty of sick leave, the University will not allow you to use that for parental leave, unless your child or spouse is actually sick. The University’s policy states: "Sick leave may be utilized by employees when they are unable to report to work due to personal illness, accident, exposure to contagious disease, or medical appointments when such appointments cannot be scheduled after working hours. 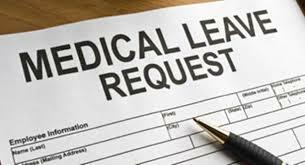 Sick leave may also be used to attend to members of the immediate family who are ill and/or in instances of death in the employee's immediate family." Of course, to get paid because you’re too sick to work requires quite a bit of paperwork, including documentation from your doctor. This means that a pregnant woman who works at MSU can only use sick leave to get paid while taking time off if her doctor states that she is unable to work due to a medical reason; and a man who works here cannot use sick leave to care for, or bond with a new child unless the child or his spouse is ill enough to have a note from the doctor. So, unless you use vacation time (something faculty members do not accumulate), you will not be drawing a paycheck from the University if you take time off under FMLA to be a new mother or father. One bit of good news is that as employees of the State of New Jersey, we have access to Family Leave Insurance (FLI), which pays up to 60% of your salary, for up to six weeks, while you take time off to bond with a new child. This is not a government subsidy: it is fully funded by employee contributions. At the Union’s FMLA workshop, coming later this fall. On August 28th, AFT Local 1904's Executive Board participated in the AFL-CIO's Common Sense Economics training, titled "Workonomics" and learned how unions have helped to grow -- not hurt -- the economy. A review of historical economic trends illustrated how the country's wealth was fairly shared with working people when unions were strong and how worker wages have stagnated since the mid-1970s when income inequality began to grow as a result of neoliberal economic policies. To address this problem, the Executive Board is embarking on an effort to increase the number of full-dues members at Montclair State University and have committed to a membership recruitment drive. By growing our membership, we strengthen our position at the negotiations table and the Local's ability to fight for a fair contract. When you are approached by a colleague about becoming a full-dues paying member, all we ask is that you keep an open mind. Building a strong union is doesn't just benefit us today but helps the next generation, including our children, have secure economic future and an economy in which all workers can benefit and succeed.